The Norwegian Publishing House, managed by the Norwegian Union of Seventh-day Adventists, placed God center stage at the Oslo Book Festival, Nov. 10-12, as it presented two books, Ærlig talt, Gud [Seriously, God] by Harald Giesebrecht, and Luther 500, by Tor Tjeransen. “It is more about evangelism than marketing for the publishing house,” said managing director of the Norwegian Publishing House Terje Dahl. Publishing house leaders and authors were apprehensive to see whether people would turn up to attend the presentation of two religious books on a Saturday afternoon. But their fears were unfounded, as dozens of people attended the presentation of Seriously, God. Giesebrecht’s book deals with topics that usually challenge the faith of many people, including Christians. 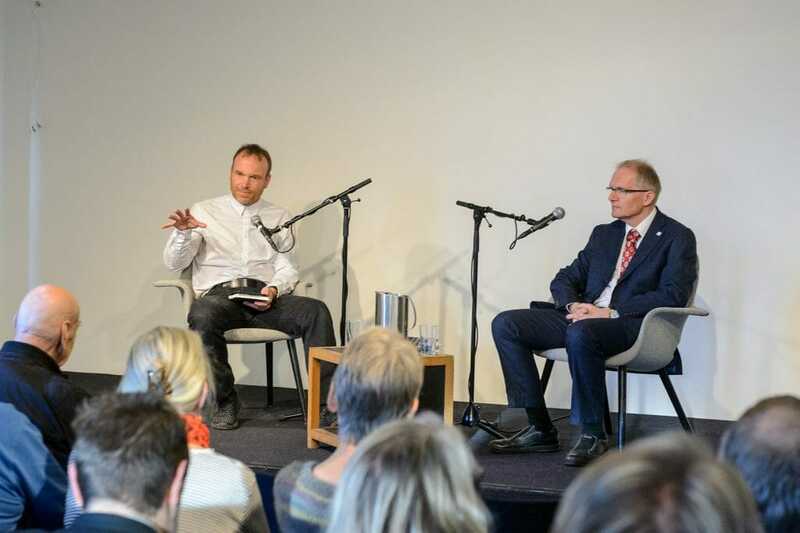 Terje Dahl (right), Director, Norsk Bokforlag (Norwegian Publishing House) interviewing Harald Giesebrecht about his book “Ærlig talt, Gud” (Seriously, God) at the Oslo Book festival at Litteraturhuset, Oslo on Saturday November 11, 2017. Giesebrecht was not afraid to answer some very pointed questions: Do I have to believe in hell? Does God demand the sacrifice of humans? Was Jesus a fire-and-brimstone preacher? Tjeransen spoke on Martin Luther. Dozens of people also listened to the topic “Corruption hunter by the grace of God.” He noted that today, we are still reaping the benefits of the bold way Martin Luther criticized corruption in Medieval society. “Even as we celebrate the 500th anniversary of the Reformation, the ideas of the Reformation must continue in contemporary society and still be inspired by the Bible,” Tjeransen said. Attending the Oslo Book Festival was a new experience for the publishing house, but is seen as an important new step as Seventh-day Adventists in that northern European nation move to reach out to a wider public. Dahl plans to build on what they learned this year in preparation for future participation. “The publishing house presented two titles that we believe the public should be aware of,” he said. Dahl sees these two titles as part of the publishing house assignment, namely, to stimulate faith. “Some people claim that the Reformation has no relevance in contemporary society. But we say, ‘Reformation is relevant and must go on,’” he said. Though no books were offered for purchase at the Sabbath presentations, they will be readily available in bookstores across the country.